Watson had a front-row seat when Armstrong switched jerseys; turns out he wasn't wearing the yellow over his Discovery jersey -- he just has really convincing arm warmers. Watson also speculates that tomorrow's stage might see the first breakaway of the Tour for Jens Voigt, who spent more time in front than a sled dog last year. Voigt is a friend of Armstrong's, Friday's stage ends in Germany, and he's not much of a climber, so Discovery could afford to see him in the yellow jersey for a few days if he can make the break stick. CSC's Jens Voigt, who will one day win someone a bar bet after becoming the first ever leader of cycling's ProTour, says he doubts six-time winner Lance Armstrong will even start this year's Tour de France. In an interview with Berliner Morgenpost (rough Google translation), Voigt says teammate Ivan Basso can win this year's Tour, "above all because I don't think Armstrong will be there." 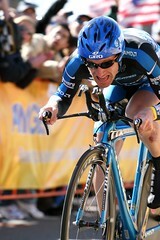 "Lance knows nothing goes on forever, and he certainly doesn't want to finish second," Voigt said. If, however, Armstrong follows through with his announced plan to race the Tour, Voigt thinks he'll take home a seventh title with a five-minute lead. 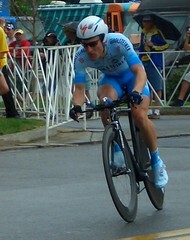 Voigt finished second behind Armstrong at last year's Tour de Georgia. Both are racing at Paris-Nice this week. 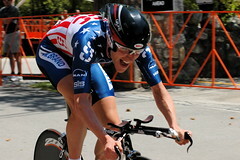 Traditionally, Tour riders can pad their pocketbooks by racing in criteriums around Europe, and demanding an appearance fee from the race sponsors. 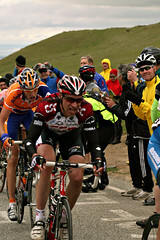 Lance Armstrong will participate in two such races this week, in the Netherlands and in the Czech Republic. Armstrong's appearance fee is reportedly 110,000 euros. 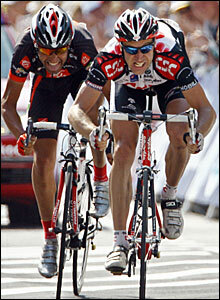 Also, Jens Voigt has extended his CSC contract for another 2 years. 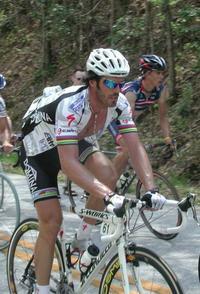 The post-Tour period is traditionally a very active one for rider contract signings. One signing I won't be expecting is Michele Bartoli re-upping with CSC. Jan Ullrich showed very good form Monday, finishing second to Gerolsteiner's Michael Rich in the Tour of Germany's opening time trial. Third on the day was Gerolsteiner's Uwe Peschel. "I don’t know why people are so worried," Ullrich told the assembled media. 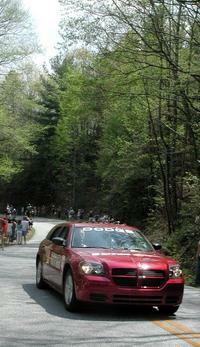 "All I did was not start a couple of races because they were too early in the season. I’m not worried at all. 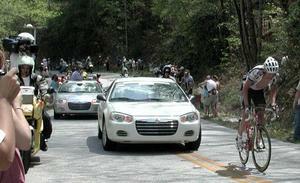 I’m here at the Tour of Germany to test myself, but not to win." Ullrich is 30 seconds ahead of Jens Voigt, who finished 2nd to Lance Armstrong in the Tour de Georgia last month, and who must be considered the early favorite for the overall because of the strength his CSC team has shown this year.